I am a little late getting this one posted. Another somewhat busy week and the weather was so craptastic that it was hard to find the motivation to shoot. However, this week was probably a better week for this challenge than I would have initially thought. Just nothing but me and the warmth of the fire on the coldest night of the year (-50ish with the windchill). It is simple, to the point, and should make you feel the warmth through your screen. Let me know what you think of any of these. Last week was a black and white photo of inspiration. The week before that was a motion shot. We’re at the week three point in this 52 week challenge. I’ll be entirely honest. I’m having a tough time finding the extra time to devote to the challenge. Life happens. However, I am still committed to getting something submitted each week. This week, we had to take a photo to be done in black and white. The idea around it was one word: inspiration. Well, when I can’t go out and shoot something out in the external world, I find inspiration in my world. Realistically speaking, of of the more inspiring aspects of my life is my faithful pooch, Houdini. Sure, I used a pic of him last week. However, I had a great opportunity for a nice shot on Saturday morning with the light coming through the living room window. So yeah, here’s my week 3 submission. Here’s last week if you want to check it out. This one is up a little late. Oops. Life happens. It’s been a busy week. However, I was able to capture a photo that I think goes with the theme. The idea is to use the rule of thirds for composition and somehow demonstrate motion with your photo. So, here it is. My all-time favorite subject doing is all-time favorite activity. 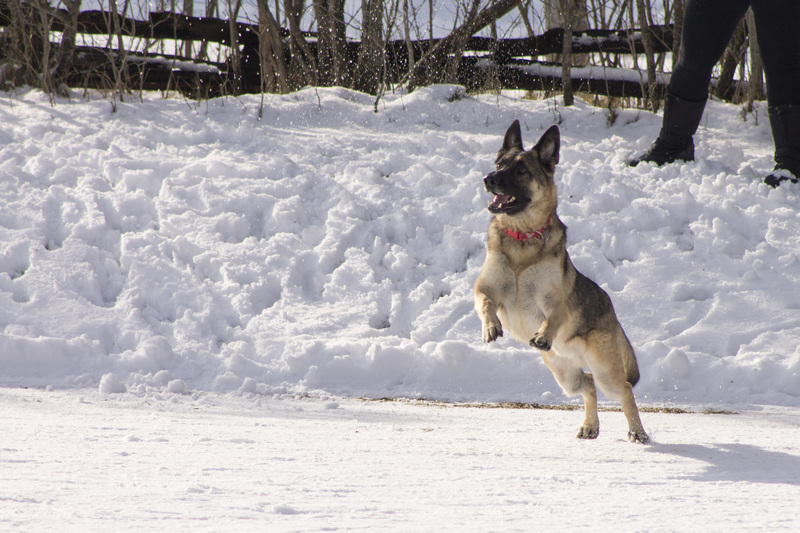 Houdini jumping to catch a snowball. Seriously, there’s nothing in life that he loves more. Honestly, action shots of this boy are some of the best things I capture. Here’s what I did last week. I might as well make this a doggy blog. Nah. I think we still do photography here. I can’t help it that this guy is so darned photogenic. These are photos of Houdini going all the way back to Easter. The sunset photo was done with my iPhone, so it isn’t quite as crisp. Mit Liebe Photos with Santa! On Saturday I had the pleasure of taking photos for a phenomenal fundraiser that benefited the Mit Liebe German Shepherd Rescue located here in the greater Green Bay area. We had around 40+ pups come on through to meet with Santa Claus. It was a wonderful time. Below are some of my favorites. For those of you who came through for photos, here is the online album of images. They aren’t all uploaded as of this post, but will be there by end of day today (Tuesday). You can feel free to download and print as you wish. You have full reproduction rights! Merry Christmas! The Packers have dropped three straight stinkers. You know what makes that all better? A German Shepherd in a Packers jersey! Here is Houdini showing off some gear from the Packers Pro Shop!